In the program booklet for the Khara Expo, Anno states that, for content-related reasons among others, he will decide what to do concerning the 3.0 CRC when Shin Eva is released. He does emphasize the importance of the CRCs to him, including the upcoming Shin Godzilla book, and the Yamato and Gundam record collections which inspired them. However, according to MNEF, the booklet also indicates that the 3.0 storyboard book (included in the previous two CRCs) will be published separately in the near future, apparently along with individual versions of the 1.0 and 2.0 storyboard books. Last edited by 1731298478 on Thu Dec 08, 2016 9:00 pm, edited 1 time in total. The storyboard books are now available for preorder, with a projected February 2017 release date. Oooh, nice. I wonder if there will be any deleted material in there? 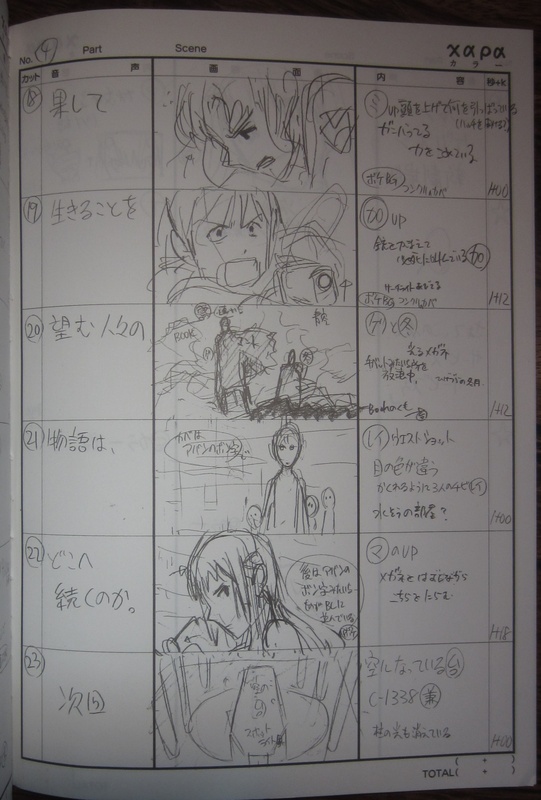 The previous 2.0 storyboard book had the blood splattering the moon sequence and a couple others, iirc. How do the Storyboards compare with the material in the Groundwork books? IOW, what would be the interest in getting them if the Groundworks are already on your shelf? While groundworks are more or less design work sketches, storyboards tell the story of the movie from beginning to end. There's (most likely) four panels on each page, and each panel is a frame from an action in the movie. CRC books are the design works and sketches in the main book and storyboards in their own books. I'm not really expecting much from this storyboard book. It'll likely be sanitized since we're not getting a CRC with it. Previous CRCs and their storyboard books contained the occasional scene that never made it into the final movie. Does the Eva Store ship internationally? And how can I order? TMBounty_Hunter wrote: I'm not really expecting much from this storyboard book. It'll likely be sanitized since we're not getting a CRC with it. Previous CRCs and their storyboard books contained the occasional scene that never made it into the final movie. Do you suppose the storyboard books for 1.0 and 2.0 will contain anything that wasn't in the CRCs? I tend to think not, given that the CRCs are what they are, but one never knows. I don't really see them putting much effort into the 1.0 and 2.0 ones. They seem to be only done out of necessity for completion since having just the 3.0 storyboards as a separate product would seem silly. If you check the evageeks twitter, I posted some photos of the storyboards and they retweeted me. Just realized that we now know the CRC won't come before 2020. Bumping this was a terrible tease and you should feel bad. What she said. I was expecting a release date. Sorry. ;_; Didn't think it would be understood that way. For a moment you were happy though. That's like instant gratification. Of course I'm happy for the 10 seconds it takes me to bolt that burger, but the feeling of remorse will stay much longer. I'm the dark side of the force.